Our troughs do more than just drain waste water. Like all our products, High Mark drain troughs are built from durable materials and designed with a focus on function. Imagine a simple solution to a tangle of PVC filling your bulkhead. High Mark drain troughs provide just that—superior containment while freeing up valuable space. They also support light foot traffic meaning you can utilize the open space in the bulkhead for maintenance and repairs. With integrated lint screens, our troughs are approved for lint filtration, eliminating the need for an expensive lint interceptor elsewhere in your laundry. 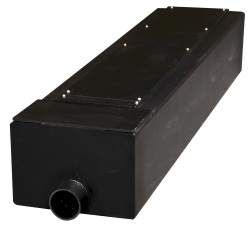 Whether draining into the top of our troughs, through a water-tight connection into the side, or with a stand pipe for pump-drain machines, we can size a trough for any space. Install in ground or above, and if they are ordered with High Mark bulkheads they come pre-sloped. And our troughs carry an ICC-ES listing insuring they are compliant to Section 1703 of the International Building Code, ASME Code 112.6.3 and International Plumbing Codes 406.1 and 1003.6.